Sept. 21, 2016, 9:37 a.m.
With its algorithm, Ownpage shows readers stories based on their reading habits and what other similar users are reading. By Joseph Lichterman @ylichterman Sept. 21, 2016, 9:37 a.m.
About two years ago, the daily French financial newspaper Les Echos was looking to expand its email newsletter offerings. The paper knew that readers reached via email tended to be more loyal than those coming from social media or Google, so it wanted to find a way to better reach those readers. “We really wanted to do something different to generate loyalty and to convert our newsletter users into subscribers,” said Yasmine Maslouhi, Les Echos’ digital marketing and audience development director. After researching its options, Les Echos decided to begin offering a personalized newsletter last year. Twice a week, the paper sends an email to its registered users with suggested stories based on their reading habits. The personalization service is run by Ownpage, a French startup that offers tools to news outlets that allow them to customize their coverage for readers. The company originally thought that most of its business would come from publishers wanting to create personalized sections of their websites for users. The company wouldn’t disclose revenue, but Cambon said Ownpage is on pace to be profitable by next summer. Last year, it raised €400,000 from three French VC firms. Ownpage doesn’t sell ads, and doesn’t sell user data, Ownpage business developer Martin Katchadourian said. It charges publishers based on the number of users who use its products, whether that’s the newsletter or the on-site applications. “We only sell the service and the solution,” Katchadourian said. Ownpage has seen publishers use its service in two primary ways: to grow their subscriber base or to provide an extra benefit to those who are already paying. Les Echos, for example, sends its newsletters to all registered users. The newsletters are opened about 500,000 times per month and they drive about 150,000 visits to Les Echos website per month. The paper wouldn’t share how many subscribers it’s signed up due to the newsletters, but Maslouhi said it’s “a small number” and that there’s still “growth opportunities.” Still, the newsletter is the traffic source that’s generating the most subscriptions, and the conversion rate from overall newsletter recipients has increased by 10 percent since Les Echos added the personalized email. Les Echos is now looking at expanding its use of Ownpage in a couple of ways. It’s considering whether to create a newsletter featuring its opinion writing, and it’s also looking into building a product aimed at readers who’ve registered with with the site but aren’t very active. The Paris newspaper Le Monde, meanwhile, has taken the opposite approach in its use of personalization. It’s using Ownpage to run a personalized section of its homepage for subscribers, which features five stories that are updated throughout the day. Le Monde went live with Ownpage in March 2015, and shortly after the launch, product manager Laure Constantinesco said clickthrough rates on the personalized section were between 1.16 and 1.27 percent. That’s higher than the stories in the section directly below it, which was the most recommended stories from Facebook. Last fall, the paper ran an experiment where it put the Ownpage module on its article pages as well with the most recommended from Facebook. But the difference between the two sections was only about 5,000 clicks, so Le Monde decided it wasn’t worth the expense to expand its use of Ownpage. While Le Monde has been satisfied with the results its seen from Ownpage, it’s not sure how much longer it’s going to continue with the service. This spring, Le Monde embarked on an 18-month website redesign process, and as part of that process it’s looking into whether it wants to continue having a separate subscriber homepage. One of the goals of the revamp is to increase internal circulation on its website, and Constantinesco said that personalization might be one way to boost that metric. Still, she said, in her mind, it’s an open question how much personalization matters for news websites. Photo by Dennis Skley used under a Creative Commons license. POSTED Sept. 21, 2016, 9:37 a.m.
Lichterman, Joseph. "This French startup is helping news orgs build personalized email newsletters for readers." Nieman Journalism Lab. Nieman Foundation for Journalism at Harvard, 21 Sep. 2016. Web. 24 Apr. 2019. Lichterman, Joseph. 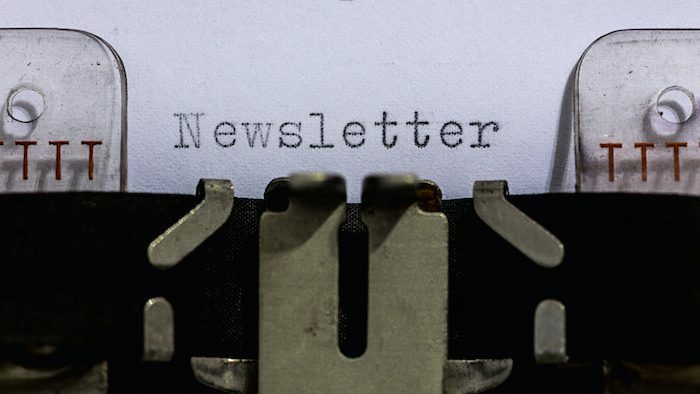 "This French startup is helping news orgs build personalized email newsletters for readers." Nieman Journalism Lab. Last modified September 21, 2016. Accessed April 24, 2019. https://www.niemanlab.org/2016/09/this-french-startup-is-helping-news-orgs-build-personalized-email-newsletters-for-readers/.